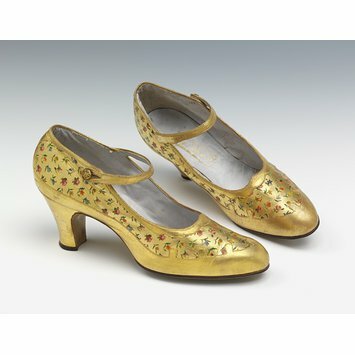 This pair of ladies' evening shoes, in gold kid, is painted and lined with grey kid. It is labelled 'Hand made expressly in Belgium for Lilley & Skinner Ltd., London', and painted with a pattern of multi-coloured sprigs. 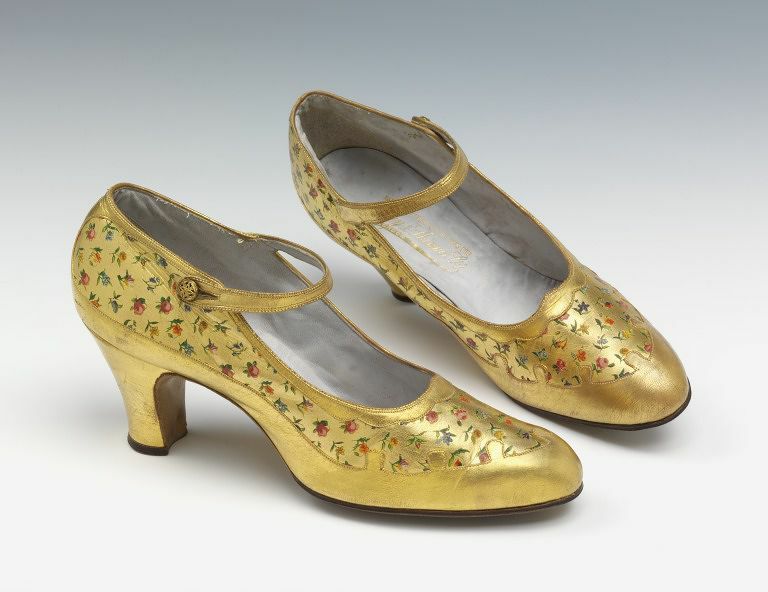 The 1920s produced the most exciting shoes of the century, with tremendous variety in cut, colour and ornamentation. Most shoes were high-heeled, even for dancing, necessitating straps over the instep. Bright colour mixes reached a peak by 1925. Pair of woman's evening shoes of painted gold kid, and lined with grey kid. Labelled 'Hand made expressly in Belgium for Lilley & Skinner Ltd., London'. Painted with a pattern of multi-coloured sprigs. Rounded toe, button ankle-strap and a medium high heel. Machine-stitched. Painted with a pattern of multi-coloured sprigs.